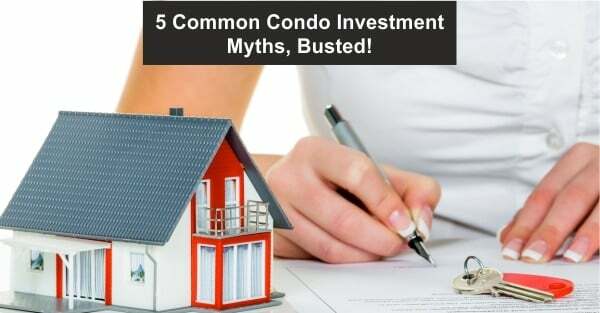 5 Common Condo Investment Myths, Busted! If you’ve ever kicked around the idea of investing in a condo, you’ll most likely have noticed a curious thing: everybody around you is secretly a master-level real estate expert. Don’t believe us? Next time you’re hanging out with a group of friends, just casually mention that you’re considering investing in a second property, and we’ll bet you dollars to doughnuts that the conversation is suddenly awash with all sorts of “helpful” tips, tricks, and things you NEED to look out for. The trouble is that while your pals no doubt mean well, you’re bound to get some info that’s outdated, conflicting, or plain, downright wrong. Don’t fret, though – we’ve been around the block enough times to help you sort the good advice from the bad, and are happy to help you out by spending today’s blog dispelling five of the most common condo investment myths. This is the biggest (and often, most frustrating) misunderstanding when it comes to investing in a condo, so we thought we’d get it out of the way first. Unfortunately, just because you’re springing for a brand-new (or even pre-construction) build doesn’t in any way guarantee that you’ll be getting a “perfect” piece of property. Building condos is a tricky business – if it were easy, everyone would do it! That’s why it’s not uncommon to come across all sorts of issues when buying a new condo, ranging from the cosmetic problems (such as drywall cracks, missing paint, flooring issues, etc.) to much more serious structural concerns (think leaks, building envelope issues, mechanical problems, and so on). If you encounter a problem with your new condo, the first step you need to take is to research your building’s developer. Find out all the details you can about the build, the work that was done, and the provided warranty. Then, act, making full use of the warranty provided before it expires, because once that arbitrary expiration date comes and goes, you’re on your own to deal with whatever troubles might be ailing your unit – regardless of how long they’ve been an issue. This is one that we hear quite frequently in our line of work, and the bottom line is that in the end, it really depends on a number of factors – including your own personal preference. Single-family homes tend to offer an additional element of stability and certainly can be quite lucrative. However, if you’re looking to invest in a downtown property, chances are a condo will offer you a better return and can ultimately be a more profitable investment than a house in the suburbs (albeit with a touch more risk involved, given the ebb-and-flow nature of these sorts of real estate markets). Again, this bit of advice is only semi-helpful at best. Yes, it’s very convenient for your investment property to be close at hand when it comes to any situation in which you need to be on-site (repairs, maintenance, meetings with tenants, etc. ), but that’s not the only factor to consider. Ultimately, you’re investing in this property to make money – so, if you live in an area or city with extremely expensive real estate, it might not be the best place to buy. When looking around, consider population fluctuations (increases in population suggest desirability), crime stats (if you want good, long-term tenants, you’ll want to avoid areas that are having trouble with crime), price to rent ratios, and overall appreciation within the market. Yes, when renting a property, you do get to determine what the rent looks like – but that doesn’t exactly give you carte blanche to go crazy and set a rate that will allow you to retire before the year’s out. While you can fine-tune the rent you charge to be more attractive to tenants (or more lucrative for you), your hand will ultimately be guided by similar rental properties within the building and area. So, you might want to cancel that “Happy Retirement” cake you just ordered for yourself – at least for a couple years! When it comes to investments, you’re supposed to buy low and sell high, right? Well, sort of. This is generally a decent rule of thumb, but real estate tends to be a bit less fickle than the TSX. At the end of the day, it all comes down to the property itself. If you’ve made a smart investment and bought wisely, the market won’t matter as much – you’ll come out ahead in the end just the same, regardless of whether the market was up, down, or sideways when you bought. Hopefully this blog has cleared a few things up for you and will allow to go forward and invest in that condo you have your eye on confidently and with style! However, if you’re still wondering about a myth that maybe we weren’t able to cover today, we’re happy to have your back – just reach out to us at Catalyst Condo Management, and we’ll do our darnedest to dispel any hearsay and help steer you towards residential investment glory.